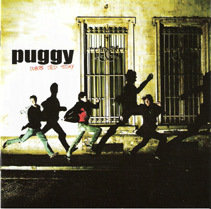 TO ME, PUGGY'S DUBOIS DIED TODAY DEBUT ALBUM sounds very 'Continental' with a slug of originality that pervades the CD. From Belgium to Blighty, this sensational new band are sure to make a glittering impression. Puggy is a formidable band who hail from Brussels, Sweden and the UK. They are out to make an almighty wave on the UK's indie shores and have already attracted a following of dedicated fans and MTV plays across the Continent. Having outgrown their domestic musical sur-roundings, Puggy are about to set the ears alight of indie youngsters and grown-ups alike in the UK. Puggy are on a European tour until November 10, supporting Incubus  at the US mega-group's personal request. Puggy debuted with perform-ances at Reading and Leeds Festivals and the following year performed a show-stopping set at the Benicàssim festival, Spain. at nearly every sweaty underground London live venue. Vince booked them to play gigs at such prestigious venues as the Jazz Café and Bordertine, and he also invited them to play Benicàssim. In early 2006, the band impressed Steve Lillywhite (The Rolling Stones, Morrissey, U2, The Pogues) when they played a private showcase for the legendary multi-Grammy award winning producer. He encouraged them to record their soon-to-be indie anthem, The Luckiest Crime. and a level of musical maturity rarely attained on an introductory album. Simple Dreams and Out of Hand, two songs from Dubois Died Today, have already achieved national playlist on Belgium's MINT, Radio 1 and FM stations. The music video for Out of Hand is also being broadcast across all music channels.  Dubois Died Today is out now on the Talkieo label. Rack up many impressive performances, playing at the Play Rock Festival de Plainevaux at Brussels Summer Festival Eu'rit-mix, the KVS Klarafestival in Brussels and Theux, opening d'Admiral Freebee. Consider a major record deal and keep the faith and remember  wash behind ears! CONGRATULATIONS, you have a Puggy!